Finding the Declination of Major, Minor or Transit-Progressed M.C. or Asc. OTHER than that a progressed planet carries with it only one-half the power (astrodynes) it had at birth, the influence is the same whether the planet under consideration is a birth-chart planet receiving the aspect of a progressed planet or is a progressed planet making an aspect to a birth-chart planet or to another progressed planet. Therefore, instead of repeating the phrase, “making an aspect to or receiving an aspect from,” when a planet makes or receives an aspect, we merely say it is involved in the aspect. Each planet maps, both in the birth chart and by progression, a particular type of inner-plane weather. This type of inner-plane weather influences the desires of the thought cells in a manner characteristic of the planet mapping it. Thus from each planet involved in a progressed aspect we may expect the thought cells to use whatever psychokinetic power they gain from the aspect to try to bring into the life conditions and events characteristic of the planet. Aside from the type of inner-plane weather indicated by the planets involved in the aspect, each aspect indicates weather that is favorable or unfavorable, or that has a special trend, which is distinctive of the aspect mapping it. 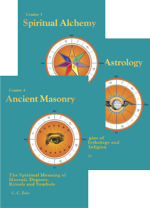 This distinctive trend is indicated by the keyword of the aspect as given in Chapter 2 (Serial Lesson 87), Course VIII, Horary Astrology. The inner-plane weather indicated by a progressed aspect chiefly influences the thought cells mapped by the birth-chart houses containing the terminals of the progressed aspect and the houses of the birth chart ruled by the planets involved. As the thought cells mapped by a house relate to a definite department of life, the houses involved show the departments of life chiefly influenced by the progressed aspect. Any progressed aspect involving the Sun affects the vitality, the significance, and the authority. The thought cells in the astral form mapped or ruled by the Sun are chiefly composed of thought elements of the type which relate to the persistence and significance of the Individual. They express as the Power Urges, map the most deep seated traits of character, are particularly important in giving power to exercise authority over others, as indicating the relations with men in general, and as being the rulers of the electrical energies which give vitality. They not only denote the ability to exercise power over others, but the ability to get the esteem and confidence of those who exercise such authority. Power and energy are not the same thing. Energy must be effectively directed to become power. Ability to dominate conditions through persistently directed desire, or willpower, resides primarily in the Individuality, or Sun dynamic structure, of the astral body. Progressed aspects involving the Sun are very important because the activity of the Power thought-cells so largely determines the Individual’s power. They indicate his ability to get along with those in authority, and his own estimation of himself or the esteem in which others hold him. He only gets honors when there is a progressed aspect involving the Sun. Any progressed aspect involving the Moon affects the mental attitude, the domestic life, and the everyday affairs. The thought cells in the astral form mapped or ruled by the Moon are chiefly composed of thought elements of the type which relate to the unconscious mind and the domestic life. They express as the Domestic Urges, map the most open and receptive avenues to the unconscious mind, are particularly important as affecting the moods, the domestic life, the relations with the common people, the relations with women in general, and as being the rulers of the magnetic energy which influences the strength of the physical constitution and therefore the health. The major-progressed Moon moves through all twelve houses and makes all possible aspects to the other planets in 27.3 years. Because its thought cells are so open an avenue for energy, its passage through each house in turn, averaging less than two and a half years, tends to bring the things signified by the department of life ruled by the house it is in at the time to the fore. In some manner the popularity is apt to be affected by aspects involving the Moon. As it relates to the Mentality, the temporary mood is indicated by the planet to which it makes a progressed aspect. Any progressed aspect involving Mercury affects the mental interests, the facility or accuracy of expression, and increases the cerebral activity. The thought cells in the astral form mapped or ruled by Mercury are chiefly composed of thought elements of the type which relate to perception and intellectual effort. They express as the Intellectual Urges. Mercury is the messenger. The planet with which it is involved in a progressed aspect influences the trend of thinking; and the departments of life mapped by the houses occupied by Mercury and the other planet involved in the aspect tend to become subjects of thought. Thus an aspect with Venus turns the thoughts toward mirth, an aspect with Mars turns the thoughts toward strife, an aspect with Jupiter turns the thoughts toward optimism and expansion, and an aspect with Saturn turns the thoughts to serious matters, to caution and to security. While discordant progressed aspects involving Mercury are operative there is a tendency to attract misfortune through errors, which may be those of the person experiencing the aspect, or of others with whom he is dealing. Clerical errors, mistakes in addressing letters, mistakes in making change, documents purposely or by error wrongly worded, and saying the wrong thing, are common difficulties that arise. Harmonious progressed aspects involving Mercury, on the other hand, give facility in writing and talking, and comparative freedom from error. They also favor travel; although there must be a progressed aspect involving the ruler of the third house for a short journey, and a progressed aspect involving the ruler of the ninth house for a long journey. Any progressed aspect involving Venus affects the emotions, the social relations, and the artistic appreciation. The thought cells in the astral form mapped or ruled by Venus are chiefly composed of thought elements of the type which relate to feeling. They express through the Social Urges, and the things they attract come into the life through social relations. There may be an attraction to music, dancing, art or other common avenue by which the emotions are given expression; or the emotional nature may merely become more sensitive to such contacts as already have been established. Neither a love affair nor marriage can be expected unless the ruler of the fifth or the ruler of the seventh is involved in a major-progressed aspect; but a progressed aspect involving Venus has a definite influence upon such affectional matters as are present. If Venus is involved in a discordant progressed aspect, not only will there be a tendency for misunderstandings to develop, but the individual inclines to be unusually sensitive to imaginary slights or opposition. If he can realize this and train himself to overlook discord he will fare much better. When Venus is involved in a harmonious progressed aspect, affectional matters move forward smoothly, and the attitude tends to be buoyant and pleasure seeking, attracting many happy occasions and joyous expressions. Venus inner-plane weather influences about one-fourth of all the good fortune experienced by mankind. Any progressed aspect involving Mars brings strife, haste and increased expenditure of energy. The thought cells in the astral form mapped or ruled by Mars are chiefly composed of thought elements of the type which relate to energy. They express through the Aggressive Urges. Whether the psychokinetic energy attracts infection, accident or combat, is diverted into mental creation, healing and surgery, into mechanical work, or into the building of something depends on whether the thought cells given activity are discordant or harmonious. Only in so far as it can be controlled is Mars energy beneficial; and even under the most favorable aspects what is gained is at the expense of initiative and strife. One must fight for any advantage Mars brings. Mars is a social planet, and while its aspects are effective conflicts with others tend to develop. The individual feels less submissive, and is more active and aggressive than usual. If the aspect is favorable, it gives him the ability to win his objective in spite of opposition. But if the aspect is unfavorable he suffers severely from the antagonism of others. Mars is also the mechanical planet, and its progressed aspects affect the relations with machines, with sharp instruments, and the various agencies which may cause accidental injury. Machines give trouble under adverse aspects involving Mars, and surgical operations and accidents take place only while some major-progressed aspect involving Mars is present. Haste is often a contributing factor to such accidents. Impulse and over-exertion are Mars tendencies, and fevers and infection are attracted only while there is a progressed aspect involving Mars. Mars inner-plane weather influences about one-fourth of all the trouble experienced by mankind. Under Mars inner-plane weather cultivate patience and take it easy. Any progressed aspect involving Jupiter affects the individual through abundance, increased optimism, and joviality. 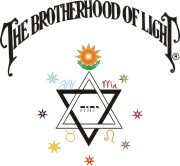 The thought cells in the astral form mapped or ruled by Jupiter are chiefly composed of thought elements of the type which relate to good fellowship. They express through the Religious Urges, and the things they attract into the life are not derived from work and hardship, but from good fellowship and patronage. Jupiter is the salesmanship planet, and the things attracted by its thought cells are derived chiefly from the benevolence and good will of others. They give an optimism which tends toward expansion, and they incline toward thoughts of religion and business. Jupiter is a business planet, and contacts with merchants, bankers, the clergy, lawyers and doctors are particularly affected by the activity of its thought cells. The most fortunate of planets, its thought cells use their psychokinetic power to bring Abundance. Even such afflictions as they bring are due to an excess of something, such as excess of food, or excessive richness of food which injures the health, excessive expenditures which affects the finances, over expansion which affects the credit, or too great generosity, carelessness or extravagance. Jupiter inner-plane weather influences about one-half of all the good fortune experienced by mankind. Any progressed aspect involving Saturn brings work, responsibility, and economy or loss. The thought cells in the astral form mapped or ruled by Saturn are chiefly composed of thought elements of the type which relate to security. They express through the Safety Urges, and the things they attract into the life are derived from responsibility, perseverance, plodding labor, system, organization, hardship or loss. If the aspect is harmonious the work done is productive of commensurate gain; but if discordant, there is inadequate recompense for labor expended. Saturn is a business planet, but the method it follows is always restrictive, and thus the opposite of that employed by Jupiter. His gains are made through economy, system, order, shrewdness, and taking advantage of the necessity of other persons to buy at the lowest figure. In selling under progressed aspects involving Saturn the appeal must be made by means of presenting a bargain; and in buying a harmonious aspect involving Saturn is the best influence to attract a bargain. The most unfortunate of planets, its thought cells use their psychokinetic power to bring Poverty. The afflictions they bring are due to a lack of something, such as inadequate diet affecting the health, death or sickness affecting the home, or loss affecting finances. Saturn inner-plane weather influences about one-half of all the troubles and losses experienced by mankind. Under Saturn inner-plane weather keep your chin up and cultivate cheerfulness. Any progressed aspect involving Uranus affects through something sudden, through a human agency, and brings change into the life. The thought cells in the astral form mapped or ruled by Uranus are chiefly composed of thought elements of the type which relate to originality. They express through the Individualistic Urges, and the things they attract into the life come suddenly, through some human agency, and inaugurate a change which after they have passed in some manner leaves the life on a higher mental level. They tend to bring into the life new persons and new conditions, to take out of the life old associates and old conditions, and to bring new ideas which profoundly affect the life. Uranus is the radical planet. He has a code of his own and is utterly indifferent to convention. Thus unconventional attachments or unconventional views flourish when his thought cells are active. More than any other thought cells they tend to the formation of sudden strong attachments and the breaking of them. Breaking one attachment often coincides with forming another. Yet an attachment formed under a progressed aspect involving Uranus is apt to last only while the aspect is within the one effective degree of perfect. Uranus has particular rule over astrology and the occult sciences, although both Neptune and Pluto incline also to such studies. When the progressed aspect involving Uranus is a strong one it divides the life as if one chapter had been finished and an entirely new one commenced. And the instrument by which such changes are brought about, often as a bolt from a clear sky, is always human. The planet rules the sign of the Man, and such favors as it brings come through some person attracted by the activity of its thought cells, and the misfortunes it attracts are due to some person exercising an undue influence over the life, or through some person’s carelessness. New inventions, and gadgets requiring electricity such as automobiles and radio sets, tend to get out of order under discordant progressed aspects involving this planet. And a peculiar thing about any of the events attracted by its thought cells is that no matter how favorable they are there is also some small loss, and no matter how unfavorable they are, they are accompanied by some small gain. Any progressed aspect involving Neptune increases the imagination, increases the sensitivity, and attracts schemes. The thought cells in the astral form mapped or ruled by Neptune are chiefly composed of thought elements of the type which relate to idealism. They express through the Utopian Urges, and the things they attract into the life come without much effort, for Neptune dislikes hard work. He inclines to negativeness, to great sensitiveness and to day dreams, rather than to positive action. He also is unconventional, but less obviously so than Uranus. His thought-cell activity inclines the mind to advanced views, and to interest in occultism, psychic matters and astrology. 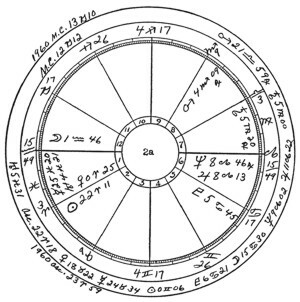 But to make an astrologer other thought cells must be active enough to overcome the reluctance of those mapped by Neptune to learn how to handle the necessary astrological arithmetic. Harmonious progressed aspects involving Neptune lead to vacations, outings and unusually pleasant experiences. Often a feeling akin to ecstasy is present. But even its more favorable aspects have a peculiar separative quality upon affectional relationships. The separation is not abrupt, as are those occasioned by Uranus, but quite gradual. Often there is a voluntary renouncement. Yet romantic attachments also may be formed. The unfavorable events attracted by Neptune’s discordant thought-cell activity usually have to do with unrealizable ideals formed by the individual, or to deliberate promotion schemes fostered to take advantage of him by others. Confidence men are represented by heavy afflictions involving Neptune; and less heavy afflictions indicate well-meaning promotion schemes which fail. Relative to the health, Neptune progressed aspects are present in all cases of poisoning, and by depressing the secretion of adrenalin and cortin they facilitate infection. Neptune tends to exaggerate, and that which approaches under its progressed aspects always seems larger than later it turns out to be, except in those rare cases in which the individual, without effort, receives some amazing benefit. The big sweepstake and lottery winnings are almost always under Neptune aspects. But by far the most of the time big benefits that are promised turn out to be small benefits when realized. Threatened calamities, that cause vast worry and fear, either fail to arrive or on arrival are of minor consequence. Imagination is active under Neptune thought-cell activity, and projects and plans that are attracted under discordant aspects tend to fizzle. Even those started under better aspects yield far less than anticipated. Usually what is promised by Neptune should be discounted by about 90%. Any progressed aspect involving Pluto affects through groups, through subtle force, and brings coercion or cooperation. The thought cells in the astral form mapped or ruled by Pluto are chiefly composed of thought elements of the type which relate to cooperation. The events they attract are unique in their power to attract the individual to participation in group activity of some kind which is sure to meet opposition from some other group. They express through the Universal Welfare Urges, and the things they attract into the life come through groups. The groups the Pluto thought cells use their psychokinetic power to bring into the life may have for purpose some selfish advantage over others, or to benefit humanity. On its better side Pluto gives the impulse to work for Universal Welfare. But on its adverse side it tends to gangdom and racketeers. It thus behooves an individual when progressed aspects involving Pluto are powerful, to use discrimination in joining forces with others, either those on the physical plane or those of the inner world. Under discordant progressed aspects an individual may become involved with the criminal underworld, be the object of kidnapers or be used as a tool by invisible racketeers. Yet under more harmonious progressed aspects there may be opportunity to join hands with others in an effort that is important for universal good. No less than Uranus and Neptune, Pluto tends to stimulate interest in occult pursuits; and particularly has the power to connect up with intelligences on the inner plane. Under its thought-cell activity the individual may have the opportunity and the desire to do some spiritual work. As do progressed aspects involving Uranus or Neptune, progressed aspects involving Pluto increase the sensitiveness of the nervous system and tend toward psychic experiences. The individual becomes unusually sensitive to the thoughts of those on either plane. Any progressed aspect involving the M.C. affects the honor, the business and the publicity. The thought cells in the astral form mapped by the M.C. are chiefly those which act as amplifiers. Whether the birth-chart M.C. or the progressed M.C., their activity attracts into the life events which influence the public standing. The type of event thus influencing publicity is determined by the characteristics of the planet involved in the aspect, and the department of life thus influencing publicity is indicated by the houses this planet rules. The business or honor also affects the departments of life indicated by the houses this planet rules. Any progressed aspect involving the Asc. affects the health, the personality, and the personal affairs. The thought cells in the astral form mapped by the Asc. are chiefly those which act as a ground wire through which the astral energy of the personality reaches the outside world. Whether the birth-chart Asc. or the progressed Asc., their activity has much significance in matters of health and how the personality affects others who are brought directly into contact with it; and how the things or people indicated by the planet involved in the progressed aspect affect the health, the personality, and bring changes into the personal life. The planet involved in the progressed aspect determines by its characteristics the manner in which the health and personality will be influenced, and the houses it rules indicate the departments of life thus affecting the personality, and affected by the personality. Because long observation indicates that on the average a progressed aspect made by the Moon attracts an event only 1/7 as important as that attracted by a similar progressed aspect made by one of the other eleven positions, it is customary to designate major-progressed aspects made by the Moon as sub-major-progressed aspects. Progressed aspects made by any of the other eleven positions to birth-chart Moon, however, are on the average as powerful to attract events as those made to other birth-chart planets. The M.C. and Asc. have the same motion by declination that the Sun has when in the same zodiacal sign, °, and ′ and moving through the same number of °s and ′s of zodiacal longitude. Turn in an ephemeris to the date when the Sun is approximately the same sign, °, and ′ of the zodiac occupied by the progressed M.C. or Asc. Find (a) the daily motion in °s and ′s of the Sun on that date by declination. Find (c) the daily motion in °s and ′s of the Sun on that date by zodiacal longitude. Find (d) the °s and ′s the M.C. or Asc. moves by zodiacal longitude on the Map. D., MED., or Transit Date, as explained on pages of Chapter 2 (Serial Lesson 111). By proportion, multiply (a) by (d) and divide the product by (c). This gives (b). By logarithms, add log. (a) to log. (d), and from the sum subtract log. (c). This gives log. (b). (b) thus found is the °s and ′s the M.C. or Asc. moves by declination during the same major, minor or transit progression interval moved by the Sun. It is the daily motion by declination of the M.C. or Asc. on the Map. D., MED., or Transit Date. Example 21: In chart 317, what is the motion by declination of major-progressed Asc. on the Map. D. for 1925? The Limiting Date for this chart is Jan. 20, 1920. The Map. D. for 1925 is July 9, 1920. The progressed Asc. for this Map. D. is 18 Sagittarius 29, calculated according to the rule given on page of Chapter 2 (Serial Lesson 111). 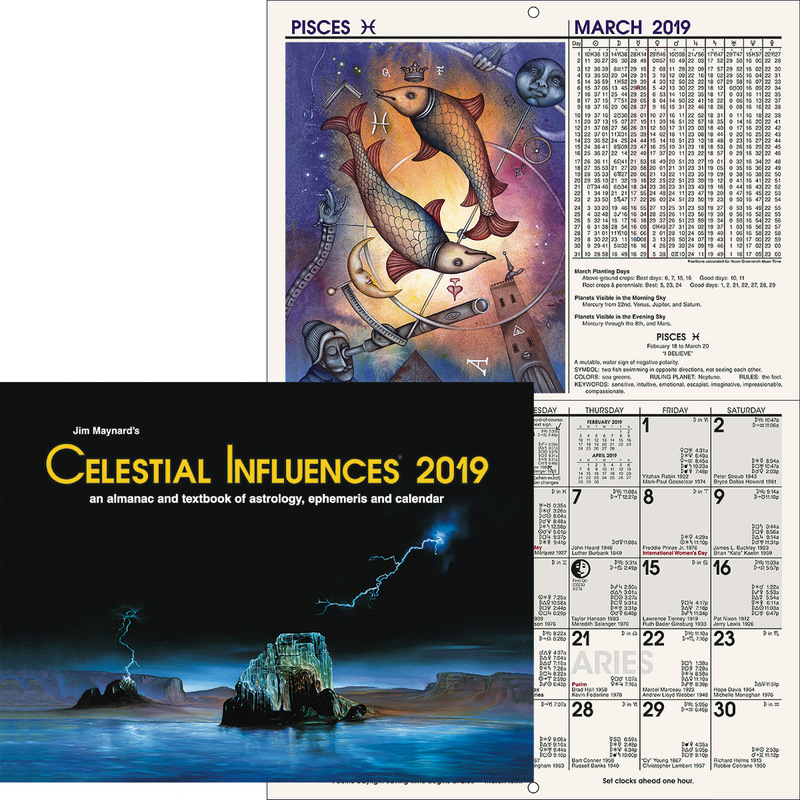 Looking in the ephemeris for the date when the Sun is near 18 Sagittarius 29, on Dec. 10, 1920, we find it 18 Sagittarius 09, with a declination of 22 S 55, and on Dec. 11, 1920, we find it 19 Sagittarius 10, with a declination of 23 S 00. The daily motion by declination is (a) 5′. The daily motion by zodiacal longitude is (c) 61′. Now to find (d) we must make the calculation explained on pages 61-62 of Chapter 2 (Serial Lesson 111). In this problem we look at a table of houses for latitude 30 and find that the difference between the nearest and the next nearest Asc. to 18 Sagittarius 29 is (a) 48′. The difference in the same column between the nearest and the next nearest M.C. is (c) 60′. The Daily motion of the Sun on the Map. D. (July 9, 1920) is 57′. Multiplying (a) 48 by (d) 57 gives 2736. Dividing 2736 by (c) 60 gives (b) 46′ as the distance the Asc. moves while the Sun moves its 57′ on the Map. D. Thus 46′ becomes (d) of the main problem. By proportion, multiplying (a) 5 by (d) 46 gives 230. Dividing 230 by (c) 61 gives (b) 4′. By logarithms, adding log. (a) 2.4594 to log. (d) 1.4956 gives 3.9550. Subtracting log. (c) 1.3730 from 3.9550 gives 2.5820, which is log. of (b) 4′. 4′ is thus the daily motion by declination of major-progressed Asc. on the Map. D. for 1925. Example 22: In chart 317, what is the motion by declination of major-progressed M.C. on the Map. D. for 1951? The Limiting Date for this chart is Jan. 19, 1920. The Map. D. for 1951 is Aug. 4, 1920. The progressed M.C. for this Map. D. is 26 Libra 36, calculated according to the rule given on page of Chapter 2 (Serial Lesson 111). Looking for the date when the Sun is near 26 Libra 36, on Oct. 19, 1920, we find it 25 Libra 48, with a declination of 9 S 58, and on Oct. 20, 1920, we find it 26 Libra 48, with a declination of 10 S 20. The daily motion by declination is (a) 22′. The daily motion by zodiacal longitude is (c) 60′. On the Map. D. (August 4, 1920) the daily motion of the Sun is 57′. As the M.C. moves at the same rate the Sun moves, the daily motion of the M.C. (d) is also 57′. By proportion, multiplying (a) 22 by (d) 57 gives 1254. Dividing 1254 by (c) 60 gives (b) 21′. By logarithms, adding log. (a) 1.8159 to log. (d) 1.4025 gives 3.2184. Subtracting log. (c) 1.3802 from 3.2184 gives 1.8382, which is the log. of (b) 21′. 21′ is thus the daily motion by declination of major-progressed M.C. on the Map. D. for 1951. Find the declination in °s and ′s occupied by the progressed M.C. or Asc. on the Map. D. If the aspect is to a birth-chart planet, find its birth-chart declination; but if it involves a progressed planet find the ° and ′ of declination occupied by the planet on the Map. D.
From the daily motion by declination of the M.C. or Asc. on the Map. D., and the daily motion of the planet by declination on the Map. D., find (a) the gain of the one on the other in °s and ′s. If the aspect is from progressed M.C. or Asc. to a birth-chart position, (a) is the daily motion by declination of M.C. or Asc. Find (b), the °s and ′s the parallel aspect is from perfect on the Map. D.
Then work the problem exactly as if finding the calendar date on which a major-progressed aspect between planets is perfect, as explained on pages 54-55 of Chapter 2 (Serial Lesson 111). Example 23: Find the date on which in chart 317 progressed Asc. makes the parallel with Venus p. On Map. D. for 1925 (ephemeris date July 9, 1920) Venus is declination 22 N 58. On page we found that on this same Map. D. progressed Asc. is declination 22 S 57. The aspect is thus (b) 1′ from perfect on the Map. 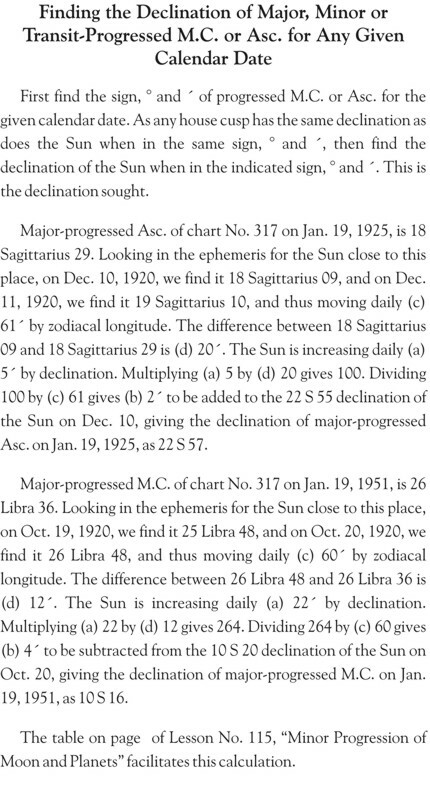 D. The ephemeris on July 9, 1920, shows Venus decreasing declination at the rate of 9′ per day. We found in example 21 that the daily motion of the Asc. by declination is 4′. As Venus is decreasing in declination and Asc. (as shown by Sun when in same zodiacal degree) is increasing in declination, we add 9′ to 4′ which gives the daily gain (a) as 13′. By proportion, multiplying (b) 1 by (c) 12 gives 12. Dividing 12 by (a) 13 gives the calendar interval (d) as 12/13 months, or 28 days. By logarithms, subtract log. (a) 2.0444 from log. (b) 3.1584, and it gives 1.1140 which is the log. of (d) 1h 51m, or 111m. Dividing 111 by 4 gives 28 days. Adding this 28 days to January 19, 1925 (for which July 9, 1920, is Map. D.), gives progressed Asc. parallel Venus p Feb. 17, 1925. Example 24: Find the date on which in chart 317 progressed M.C. is parallel Uranus r. Uranus r has declination 10 S 15. On Map. D. for 1951 (Aug. 4, 1920) on page we found progressed M.C. has declination 10 S 16. The difference is (b) 1′. In Example 22 we found the daily motion of the M.C. by declination on this Map D. to be (a) 21′. By proportion, multiplying (b) 1 by (c) 12 gives 12. Dividing 12 by (a) 21 gives the calendar interval (d) as 12/21 months, or 17 days. By logarithms, subtracting log. (a) 1.8361 from log. (b) 3.1584 gives 1.3223 which is the log. of (b) 1h 9m, or 69 minutes. Dividing 69 by 4 gives 17 days. As progressed M.C. has passed the aspect on the Map. D., we subtract the 17 days from January 19, 1951. Thus major-progressed M.C. is parallel Uranus r January 2, 1951. In order that the type and harmony or discord of the important inner-plane weather may be known far enough in advance that proper precautionary actions may be taken, all major-progressed aspects other than those made by the Moon should be calculated and tabulated for a number of years ahead. And major-progressed aspects made by the Moon should be calculated and tabulated at least one year ahead so that adequate precautionary actions may be taken relative to the accessory energy they may add to the inner-plane weather indicated by major-progressed aspects of the other planets when progressed Moon makes an aspect to a terminal of one of these other major-progressed aspects. 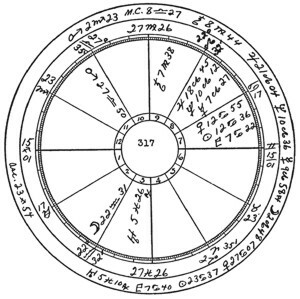 To facilitate calculating the major-progressed aspects of the Moon for a period of one year, and not inadvertently overlooking some important aspect, in addition to the birth-chart positions, including all declinations, it is well to write on the chart both the sign, °, and ′ and the declination of the major-progressed M.C. and major-progressed Asc. calculated for the two consecutive Map. D’s between which the progressed Moon calculations are to be made. Each of these Map. D’s represents the Limiting Date within a given calendar year. The difference between the sign, °, and ′ of the progressed M.C. or Asc. on one Map. D. and the next Map. D. represents its progressed zodiacal motion during the corresponding year, and the difference between the declination of the M.C. or Asc. on one Map. D. and the next Map. D. represents its progressed motion by declination during the corresponding year. The zodiacal motion and the motion by declination of each of the planets between the two successive Map. D’s show their motion by progression during the corresponding year. And as the positions of the planets in the ephemeris on the Map. D. show their positions for the L.D. within the corresponding calendar year, the calculations should start with the Map. D. and the calendar date within the year indicated by the L.D. In calculating the major-progressed aspects of the Moon for a year it facilitates the work to start with the L.D. within one calendar year and before making the calculations tabulating one after another in the succession in which they form, all the aspects made by the Moon up to the L.D. of the following calendar year. The aspects thus start with one Map. D. and end with the following Map. D., the daily motion of all the planets between these two Map. D’s being their major progression during the given year. Because the Moon’s daily motion is so great it is much easier to calculate its progressed aspects by logarithms than by proportion. However, both methods will here be illustrated. We will start with calendar date May 12, 1959, using Chart 2a on page , which has the major-progressed positions around it for this date. The Map. D. (date in the ephemeris) is May 21, 1920. On May 21, 1920, the daily motion of the Moon is (a) 14° 36′. The log. of this, which will be used for all aspects of the Moon to birth-chart positions, is .2159. Dividing 14° 36′ by 12 gives the motion of the Moon per month by major progression as 1 ° 13′, or 73′ in 30 days. 1. Moon paralled Neptune p: The Moon is decreasing in declination (a) 2° 51′ per day. 1/12 of this is 14′, the amount of progression per month. Neptune p has declination 18 N 00. The Moon has declination 18 N 01. The difference is (b) 1′. 1/14 of 30 days is 2 days. By logarithms, subtracting log. of 2° 51′ (a) .9254 from log. (b) 3.1584 gives 2.2330, which is the log. of (d) 8m. Dividing 8 by 4 gives 2 days. Adding the 2 days found by either method to May 12, 1959, gives Moon parallel Neptune p May 14, 1959. 2. Moon inconjunct Asc. 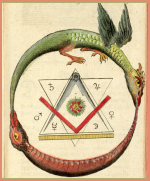 r: To reach this aspect the Moon must move (b) 19′ to 15 Leo 49. 19/73 of 30 days is 8 days. By logarithms, subtracting log. of 14° 36′ (a) .2159 from log. (b) 1.8796 gives 1.6637, which is the log of (d) 31m. Dividing 31 by 4 gives 8 days. Adding the 8 days found by either method to May 12, 1959, gives Moon inconjunct Asc. r May 20, 1959. 3. Moon sextile Venus p: To reach this aspect the Moon must close a gap of (b) 2° 52′. Subtracting the 1° 13′ Venus moves from the 14° 36′ the Moon moves gives the daily gain (a) 13° 23′. Dividing this by 12 gives the gain per month as 1° 07′. In 2 months the gain is 2° 14′. This leaves 38′. 1° 07′ is 67′. 38/67 of 30 days is 17 days. By logarithms, subtracting log. of 13° 23′ (a) .2536 from log. of 2° 52′ (b) .9228 gives .6692, which is the log. of (d) 5h 08m. Dividing 5 by 2 gives 2mo with 60m remainder. Adding this remainder to the 08m gives 68m. Dividing the 68m by 4 gives 17 days. Adding the 2 months 17 days found by either method to May 12, 1939, gives Moon sextile Venus p July 29, 1959. 4. Moon sesquisquare M.C. r: To reach this aspect the Moon must move (b) 3° 47′ to 19 Leo 17. At 1° 13′ per month this takes 3 months with 8′ remainder. 8/73 of 30 days is 3 days. By logarithms, subtracting log. of 14° 36′ (a) .2159 from log. (b) .8023 gives .5864, which is the log. of (d) 6h 13m. Dividing the 6 by 2 gives 3mo. Dividing the 13 by 4 gives 3d. Adding the 3 months, 3 days found by either method to May 12, 1959, gives Moon sesquisquare M.C. r August 15, 1959. 5. Moon sesquisquare Uranus r: To reach this aspect the Moon must move (b) 3° 51′. In 3 months it moves 3° 39′. To move the additional 12′ takes 12/73 of 30 days, or 5 days. By logarithms, subtracting log. (a) .2159 from log. (b) .7947 gives .5788, which is the log. of (d) 6h 20m. Dividing 6 by 2 gives 3mo. Dividing 20 by 4 gives 5d. Adding the 3 months, 5 days found by either method to May 12, 1959, gives Moon sesquisquare Uranus r August 17, 1959. 6. Moon sesquisquare Saturn p: To reach this aspect the Moon must close a gap of (b) 4° 30′. Saturn moves 2′ and the Moon moves 14° 36′. The difference is the daily gain (a) 14° 34′. Dividing this by 12 gives the gain per month as 1° 13′, or 73′. In 4 months it moves 4° 52′. To move the 22′ it has gone too far, takes 22/73 of 30 days or 9 days. To make the aspect thus takes 3 months, 21 days. By logarithms, subtracting log. (a) .2168 from log. (b) .7270 gives .5102, which is the log. of (d) 7h 25m. Dividing the 7 by 2 gives 3mo with a remainder of 60m. Adding the 60m to the 25m gives 85m. Dividing 85 by 4 gives 21d. Adding the 3 months, 21 days found by either method to May 12, 1959, gives Moon sesquisquare Saturn p September 3, 1959. 7. Moon semisquare Saturn r: To reach this aspect Moon must move (b) 4° 50′. In 4 months the Moon moves 4° 52′. To move the 2′ it has gone too far, takes 2/73 of 30 days, or 1 day. It thus makes the aspect in 3mo, 29d. By logarithms, subtracting log. (a) .2159 from log. (b) .6960 gives .4801, which is the log. of (d) 7h 57m. Dividing the 7 by 2 gives 3mo, with 60 remainder. Adding the 60m to the 57m gives 117m. Dividing the 117 by 4 gives 29d. Adding the 3 months, 29 days found by either method to May 12, 1959, gives Moon sesquisquare Saturn r September 11, 1959. 8. Moon sesquisquare Uranus p: To reach this aspect the Moon must close a gap of (b) 5° 01′. Uranus moves 1′ and the Moon moves 14° 36′. The difference is the daily gain (a) 14° 35′. Dividing this by 12 gives the gain per month as 1 ° 13′, or 73′. In 4 months the Moon moves 4° 52′. To move the other 9′ takes 9/73 of 30 days, or 4 days. By logarithms, subtracting log. (a) .2164 from log. (b) .6798 gives .4634, which is the log. of (d) 8h l5m. Dividing the 8 by 2 gives 4 mo. Dividing the 15 by 4 gives 4d. Adding the 4 months, 4 days found by either method to May 12, 1959, gives Moon sesquisquare Uranus p September 16, 1959. 9. Moon square Mars p: To reach the aspect the Moon must close a gap of (b) 6° 29′. Mars is moving retrograde 9′, and the Moon is moving 14° 36′. To find the daily gain we add the two motions which gives (a) 14° 45′. Dividing by 12 gives the gain per month as 1° 14′, or 74′. In 5 months the gain is 6° 10′. This leaves 19′. 19/74 of 30 days gives 8d. By logarithms, subtracting log. of 14° 45′ (a) .2114 from log. (b) .5684 gives .3570, which is the log. of (d) 10h 33m. Dividing the 10 by 2 gives 5mo. Dividing the 33 by 4 gives 8d. Adding the 5 months, 8 days found by either method to May 12, 1959, gives Moon square Mars p October 20, l959. 10. Moon square Sun r: To reach this aspect the Moon must move (b) 6° 41′. In 5 months the Moon moves 6° 05′. This leaves 36′. 36/73 of 30 days gives 15 days. By logarithms, subtracting log. (a) .2159 from log. (b) .5552 gives .3393, which is the log. of (d) 10h 59m. Dividing the 10 by 2 gives 5mo. Dividing the 59 by 4 gives 15d. Adding the 5 months, 15 days found by either method to May 12, 1959, gives Moon square Sun r October 27, 1959. 11. Moon square Asc. p: To reach this aspect the Moon must close a gap of (b) 6° 48′. The Asc. is moving (see chart) 1° 41′ and the Moon is moving 14° 36′. The difference is (a) 12° 55′. Dividing this by 12 gives a gain of 1° 05′ per month. In 6 months the gain would be 6° 30′. This leaves 18′. 1° 05′ equal 65′. 18/65 of 30 days gives 8 days (not so precise as by logarithms, as the gain is a trifle less than 1° 05′ per month). By logarithms, subtracting log. (a) .2691 from log. (b) .5477 gives .2786, which is the log. of (d) 12h 38m. Dividing the 12 by 2 gives 6 mo. Dividing the 38 by 4 gives 9d. Adding the 6 months, 9 days so found to May 12, l959, gives Moon square Asc. p November 21, 1959. 12. Moon parallel Venus p: To reach this aspect the Moon must close a gap of (b) 1° 42′. The Moon is decreasing 2° 51′, and Venus is increasing 22′. To find the gain we add these two motions which gives (a) 3° 13′. Dividing 3° 13′ by 12 gives a gain of 16 per month. The gain in 6 months is 1° 36′. This leaves 6′. 6/16 of 30 days gives 11 days (not so precise as by logarithms, as the gain is a trifle more than 16′ per month). By logarithms, subtracting log. (a) .8728 from log. (b) 1.1498 gives .2770, which is the log. of (d) 12h 41m. Dividing the 12 by 2 gives 6mo. Dividing the 41 by 4 gives 10d. Adding the 6 months, 10 days thus found to May 12, 1959, gives Moon parallel Venus p November 22, 1959. 13. Moon parallel Asc. r: To reach this aspect the Moon must move by declination (b) 1° 55′ (Asc r is 16 5 06). By declination the Moon moves (a) 2° 51′. Dividing this by 12 gives 14′ per month. In 8 months the Moon moves 1° 52′. This leaves 3′ 3/14 of 30 days gives 6 days (not as precise as by logarithms, as Moon moves a trifle more than 14′ per day). By logarithms, subtracting log. (a) .9254 from log. (b) 1.0977 gives .1723, which is the log. of (d) 16h 08m. Dividing the 16 by 2 gives 8mo. Dividing the 8 by 4 gives 2d. Adding the 8 months, 2 days thus found to May 12, 1959, gives Moon parallel Asc. r January 14, 1960. 14. Moon trine Mercury r: To reach this aspect the Moon must move (b) 9° 50′. In 8 months the Moon moves 9° 44′. This leaves 6′. 6/73 of 30 days gives 2 days. By logarithms, subtracting log. (a) .2159 from log. (b) .3875 gives .1716 which is the log. of (d) 16h 10m. Dividing 16 by 2 gives 8mo. Dividing 10 by 4 gives 2d. Adding the 8 months, 2 days found by either method to May 12, 1959, gives Moon trine Mercury r January 14, 1960. 15. Moon sextile Mercury p: To reach this aspect the Moon must close a gap of (b) 9° 04′. Subtracting the motion of Mercury, 2° 09′, from the motion of the Moon, 14° 36′, gives the daily gain (a) 12° 27′. Dividing this by 12 gives the monthly gain of the Moon as 1° 02′. In 9 months the Moon thus gains 9° 18′, which is 14′ too much. 1° 02′ are 62′. 14/62 of 30 days gives 7 days. 7 days subtracted from 9 months gives 8 months, 23 days (not as precise as by logarithms, as Moon gains a trifle more than 1° 02′ per month). By logarithms, subtracting log. (a) .2850 from log. (b) .4228 gives .1378, which is the log. of (d) 17h 28m. Dividing 17 by 2 gives 8mo, with 60m remainder. Adding the 60m to the 28m gives 88m. Dividing the 88 by 4 gives 22d. Adding the 8 months, 22 days to May 12, 1959, gives Moon sextile Mercury p February 4, 1960. Feb. 17, 1925, Asc. parallel Venus p.
May 11, 1932, Moon conjunction Mercury r.
Sept. 29, 1933, Moon sextile Mars r.
July 11, 1934, Moon conjunction Saturn p.
Oct. 16, 1937, Moon trine Moon r.
May 10, 1938, Moon square Sun p.
Jan. 2, 1951, M.C. parallel Uranus r.
April 12, 1920, 3:00 a.m. MST. 108W. 40N. L.D. May 12, 1920. M.C.C. minus 7S 12° 06′. Major progressions in outer circle are for May 21, 1959. M.C. 1959 is 22 S 53. M.C. 1960 is 22 S 48. Asc. 1959 is 08 N 41. Asc. 1960 is 09 N 18. Oct. 20, 1920, Moon opposition Jupiter r.
Nov. 7, 1922, Moon square M.C. r.
March 21, 1925, Moon conjunction Venus p.
April 29, 1926, Moon conjunction Sun r.
April 6, 1927, Moon sextile Pluto r.
March 26. 1929, Moon square Uranus p.